About Shoebaum: Shoebaum is the world's first patented Air CAM Walker with a loaded spring shock absorber sole that reduces the impact of the injured leg with the ground as the patient walks and steps on the injury. The Shoebaum is the first Air CAM Walker that also acts as a cast replacement (no more old, smelly cast needed) Shoebaum helps patients improve the quality of their recovery with each step taken, and it helps users recover easier, faster, and more comfortable compared to users recovering with traditional walker devices. Ergoactives designs, develops and markets new patented technologies in the medical device field. Our mission is to become a leader in the orthopedic field with unique ergonomic orthopedic devices for the enrichment of the mobility-impaired. Each technology will fill a current need in assistive mobility by improving upon an existing technology or device, or by designing a new device to serve a need that is clearly defined and acknowledged by medical professionals and patients with walking disabilities. About Level-Up: This product is to be used to match up the height of the user's shoe to the user's opposite leg while using any Walking Cast or Walker Boot. Created by an Orthopedic Surgeon with the user's best interests in mind. The Level-Up comes in one Size, However, all users that wear Shoe sizes 9-13 can use the velcro straps to adjust to the shoe's proper size. The Level-Up may seem longer than the size the user needs. However, the foot will be secure with the Velcro Straps, and the Level-Up will be performing its function of matching up the height of the shoe with any Walker Boot. 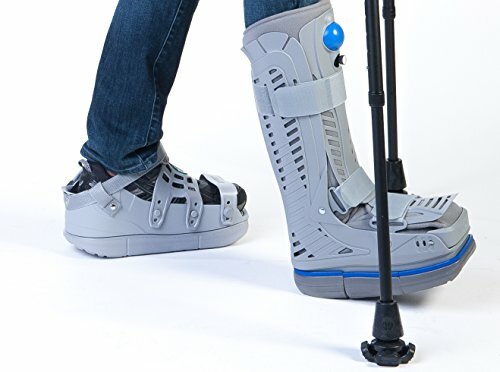 The Level-Up is to be used to match up the height of the user's shoe to the user's opposite leg while using any Walking Cast or Walker Boot.